Malaysia’s cryptocurrency guidelines determined that cryptocurrency isn’t legal tender in Malaysia, and that exchanges need to adhere to KYC rules. The public needs to be careful when transacting in crypto, due to its volatility, and how Bank Negara won’t be able to help in case of misconduct. Cryptocurrency is a nascent stage, but if it gains more commercial traction, countries might consider issuing a sovereign cryptocurrency as a safe alternative to counter the use of decentralised cryptocurrency. After a long wait, Bank Negara finally issued a cryptocurrency guideline in Malaysia in February; it basically decrees Malaysians can trade in cryptocurrencies, as long as exchanges and individuals collect information like their full name, address, and date of birth of all customers, in addition to ID documentation. This guideline came out after the market was left reeling from a recent crash in Bitcoin’s value. The regulator has also concluded that cryptocurrency isn’t legal tender in Malaysia, so individuals who still choose to transact in them are encouraged to keep that in mind and conduct their own due diligence in case of robberies or losses. Malaysia follows a global trend looking to increase transparency in cryptocurrency traders—in hopes of a clear money trail, insight on the cryptocurrency cashflow in and out of the nation, and to help circumvent issues like money laundering. 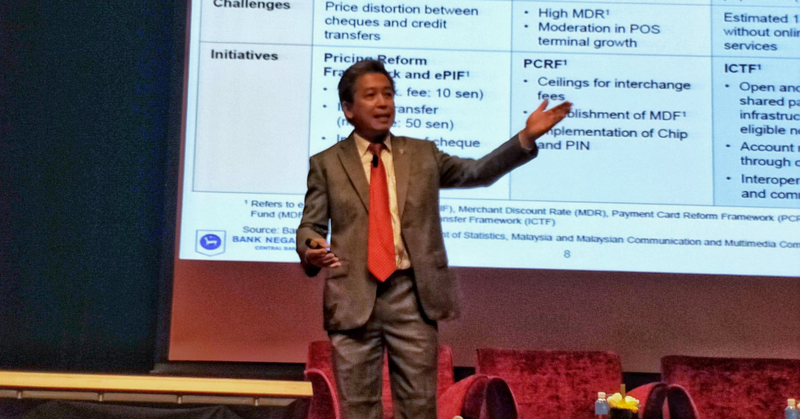 At the Malaysia Fintech Expo earlier this week, we managed to get some insight on why Malaysia has chosen to take a more permissive stance on the controversial coin. During a keynote speech by Tan Nyat Chuan, Director of the Payment Systems Policy of Bank Negara Malaysia (BNM), some among the crowd stood up to ask questions relating to cryptocurrency. While Tan may not directly handle the crypto-regulation side of things, he does have his own personal thoughts. There are many challenges to regulating cryptocurrency. Tan thinks that it’s very challenging for a central bank to be able to put in sufficient safeguards and offer the public consumer protection measures. How would local players move to comply with BNM’s eKYC requirements while still remaining competitive on a global scale? Tan thinks that cryptocurrency is in its nascent stage in Malaysia. Central banks might lose control over monetary policy when fiat currencies are not used as commonly as cryptocurrencies. That is when central banks of the world might consider offering an alternative to the decentralised cryptocurrencies. Since so many Malaysians have jumped onto the cryptocurrency bandwagon, it is heartening that Bank Negara is not banning cryptocurrencies outright, or disallowing exchanges altogether in Malaysia. Enforcing eKYC regulations might make cryptocurrencies lose some of their lustre, but overall this is a positive move forward. Tan’s observations tally with my own personal prediction that our distant future does lie in sovereign-backed cryptocurrencies, particularly with governments using blockchain to keep things transparent. You can read more about BNM’s guidelines and stance on cryptocurrencies in their official release here.